HANSATON End Users - How do we hear, anyway? The path sound takes through our auditory systems. Our ears are complex sensory organs. They have many small, sensitive sensors to pick up sound waves, bundle them together, and send them at lightning speed down our auditory nerves towards our brains. In order for the auditory centers of our brains to translate those acoustic signals into sound, music, or vitally important warning signals reliably, the sound must not be disturbed or interrupted on its path through the ear. The journey through the ear. When we talk about our ears, we’re usually referring to the part that’s visible from the outside. But that’s not even half the story. In fact, that part is just the auricle. A much larger part of our hearing systems is safe within the protection of our heads. Follow the sound on its journey through our ears. The first stop on the sound’s journey is the outer ear, which receives the sound and directs it through the auricle into our heads. Numerous little peaks and valleys act as a resonator to amplify the vibrating air. At the end of the entrance to the ear, the sound waves hit the eardrum, a thin membrane separating the outer ear from the middle ear. 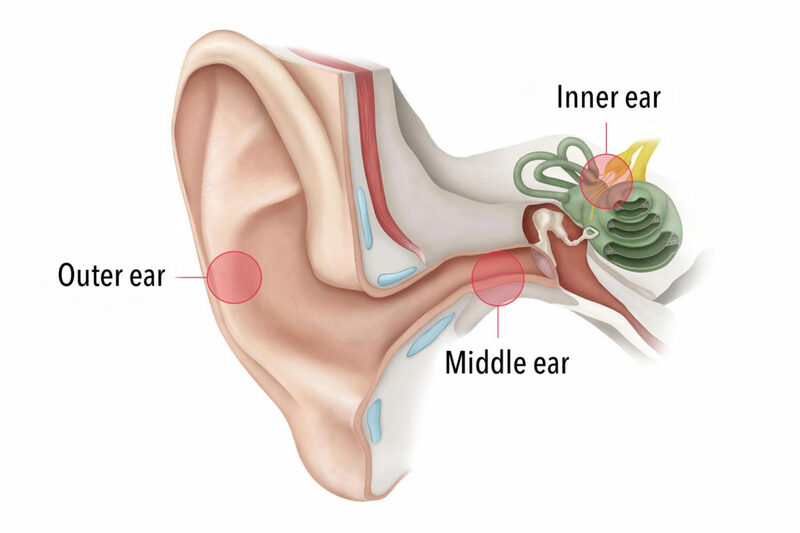 From the eardrum, the subtle vibrations are transmitted to three tiny ossicles—the smallest bones in the human body. The hammer, the anvil and the stirrup are arranged in such a way that the sound gets amplified by a factor of 20 before being directed into the inner ear. In the inner ear, the sound waves encounter the next membrane, which is called the oval window. From there, they travel to the equilibrium organ on one hand, and the cochlea on the other. The cochlea is made up of three channels filled with fluid. The sound causes tiny hair cells on the bottom of these channels to vibrate, which converts the mechanical sound waves into electrical nerve impulses. Depending on how high the frequency of the sound is, this wave movement is shifted, which shifts the place in the cochlea that reacts most sensitively to that frequency: high sounds trigger the hair cells at the front of the cochlea; lower sounds activate the ones further back. From there, the impulse is transmitted to the auditory center of the brain. 12,000 external and 3,000 internal hair cells help our ears convert sounds into nerve impulses, which is what makes it possible for our brains to perceive even tiny differences in volume and pitch. Over time, however, some of these hair cells may die out, starting with the ones at the front. When that happens, high-frequency sound waves no longer reach the brain. The result? Age-related hearing loss. But that’s just one of many causes of hearing loss. Click here to find out more about other causes and discover how to identify developing hearing loss.